PCC Arfon Jones (left) with volunteer dog welfare visitors Marie Jones and Claire Vickers. North Wales’ police and crime commissioner, Arfon Jones, has backed calls for new legislation to make it an offence to attack service animals. His comments come after the proposed Service Animals Offences Bill - also known as Finn’s Law - was delayed after the government made an objection. To date, a petition calling for change has been signed by more than 127,000 people. Finn’s Law was launched by PC Dave Wardell after he and his police dog Finn were stabbed during an armed robbery. The Hertfordshire officer suffered an injury to his hand, whilst Finn received multiple knife wounds to his head and chest. The attacker was charged with actual bodily harm for the injuries to Mr Wardell. However, he was only charged with criminal damage for almost killing Finn. Under current legislation, police animals such as dogs and horses are considered property and ‘criminal damage’ is currently the only available charge for someone who attacks one. “Police dogs and horses play an important role in a whole range of areas like crowd control, drug detection, searching for missing people and catching offenders. It is wrong that these animals are treated as equipment because they are key members of the frontline policing team," said Mr Jones. Mr Jones has established a scheme to monitor the welfare of police dogs in North Wales. 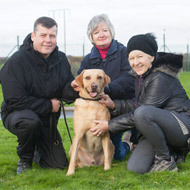 Under the scheme, volunteer dog welfare visitors make monthly unannounced visits to view dog training sessions or visit dog handlers whilst out on patrol. “It is important we have independent checks and controls in place to ensure good animal welfare standards are robustly maintained. We must ensure our dogs are happy and well cared for,” said Mr Jones.